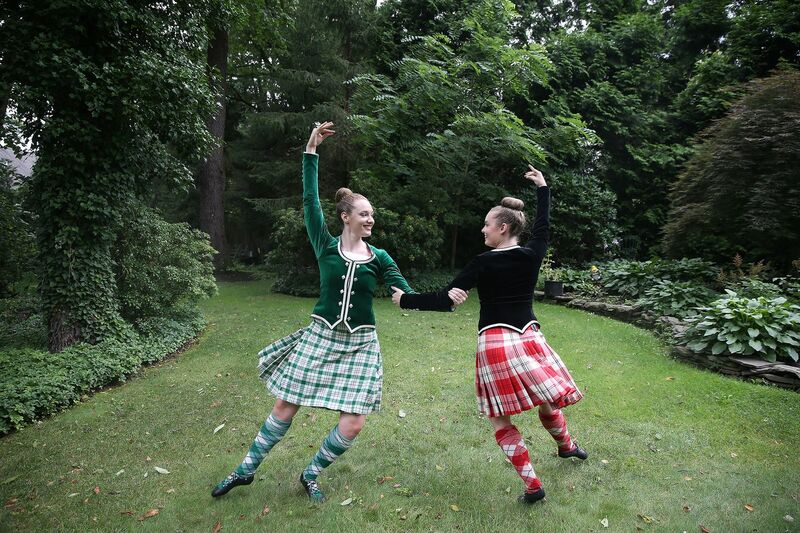 Caroline Drummond, left, and Brigid Peyton, right, practice Highlands dancing at Peyton's home in Maple Glen, They are going to Scotland this summer to dance at the Edinburgh Fringe. "The main thing about Edinburgh Fringe," says arts executive and philanthropist Louis Bluver, "is that you can really be surprised there." Bluver is explaining why, every August, like many Philly-area folks, he travels to Edinburgh, Scotland, the Auld Reekie ("The Old Smoky One"), ancient seat of queens and kings – and home to the Edinburgh Festival Fringe (Aug. 3-27), the biggest international arts festival in the world. Big means big: This year's will feature a record 56,796 performances of 3,548 shows at 317 venues. The lineup includes theater, music, dance, stand-up, circus, poetry, and more — surprise after surprise. Fringe can overwhelm as you walk along the Royal Mile, with street players up and down the road and eager performers "flyering" you (shoving fliers for their shows into your hands and making their 4.5-second pitch). The outburst of creativity overruns the gorgeous medieval town. The Edinburgh Fringe in 2017. Some Philadelphia-area folks go as one-time tourists, some as a yearly habit, and some to perform. "Going to Edinburgh Fringe, doing a show, coming back, and doing your show at Philly Fringe, it's weirdly part of being in theater in Philly," says actor Sarah Knittel. Jay Luxion of Mount Laurel has missed one Fringe in the last five: "I took one year off and really regret it," this theater buff says. Gwyn Ennis of Glenside is going to Edinburgh for her second time, mainly to see daughter Matilda and her two Maple Glen friends Brigid Peyton and Caroline Drummond dance in the Royal Edinburgh Military Tattoo, an evening spectacular with military bands and performance groups from the British Armed Forces, Commonwealth countries, and elsewhere. It plays every weeknight — and twice on Saturdays — all during August. "They had to interview, apply, audition, get accepted – and then pay for their own flight and shoes," Ennis says, "and they dance every night for room and board." It's hard-core: To ensure perfection, all dancers are videotaped every night, and slackers can be replaced. "But the girls love it," Ennis says. "The show is phenomenal." Caroline Drummond (left) and Brigid Peyton, of Maple Glen. They’ll dance in the Royal Tattoo at Edinburgh Fringe. The ways in which visitors manage the madness varies. Bluver, an experienced Fringe-aholic, says his strategy is to restrict himself mainly to shows at the better venues, such as the Traverse Theatre. "If I know a show will get out at 12:15, I work with what's nearby," he says. "I check the schedule and see what's starting at 12:30 or 12:45, something I can walk to. Because there always is. In many cases, something I never would have chosen turns out to be wonderful." Luxion says sometimes the best strategy is no strategy: "The real festival experience is to go with the flow and try things out. It's hit or miss, but that's part of the experience." That seems to be the philosophy of Dawn Willette of Merion Station, who is taking her two children to Edinburgh, the family's first time overseas. "We're not making plans," she says. "We're going to figure out things when we get there. It's a grand adventure." Catherine Beach, a retired executive in Yardley and lover of all things Scottish, is another 2018 first-timer. She's especially fond of Edinburgh, "such a walkable city," she says. "I wonder if I'll like the town as much when it's that crowded … I'll bum around, and we'll see." Rosemary Malague, director of the theater arts program at the University of Pennsylvania, takes a group of students over every other year to perform. This year, as the Penn Theatre Ensemble, an all-female cast and crew will do Curio (a Cabinet of Curiosities) by alum Danielle Bainbridge, who recently completed her Ph.D. at Yale and is headed to Northwestern. Curio concerns Millie and Christine McCoy, conjoined twins and former slaves who became celebrities on the 19th-century freak-show circuit. "We have a long tradition over more than 25 years of going to Fringe," Malague says. "It's a tremendous learning opportunity for all of us – and we get to see some great shows." And she immediately names two shows on her must-see list for this year that debuted … at Philly Fringe. There is a long and crazy tie between the two Fringes. The two shows Malague wants to see are Geoff Sobelle and Steven Dufala's Home, a profound hit at last year's Philly Fringe; and The Underground Railroad Game by Jennifer Kidwell and Scott R. Sheppard with Lightning Rod Special, a Philly Fringe hit in 2015 and co-winner of the 2017 Obie for best new American theater work. Sobelle, Dufala, Kidwell, and Sheppard are all alums of Pig Iron Theatre. Sobelle's show The Object Lesson took top prize at the 2014 Edinburgh Fringe. The road runs both ways: Edinburgh standouts such as Stef Smith's Swallow, Lucas Hnath's The Christians, and Jonny Donahoe's brilliant Every Brilliant Thing regularly come through Philly now. The Philly theater world will be well represented this year. Chris Davis is going for his fifth year in a row. He's sharing a flat with fellow Philly footlighters Knittel and Lee Minora. All will be doing one-person shows as part of Free Fringe (through Aug. 29), a gritty wonderland – 402 shows at 35 venues – of do-it-yourself plays. Philly actor Chris Davis performing “Drunk Lion,” which he’ll reprise at the Edinburgh Festival Fringe. Knittel, an Edinburgh newbie, says, "Getting there has been a five-year goal for me. At Free Fringe, they give you a time and a venue for free, and you do everything else yourself, including going out into the street and grabbing people to come see it." Minora, a second-timer, says, "Last year, I came with Chris Davis, and the first day flyering, I was so terrified, I was handing out fliers in the meekest way possible, and by the end of the festival I was telling people, 'This is the best show you're going to see at the whole festival.' You have to rediscover how much you believe in yourself and your work." Every night all month, Davis will do his solo act Drunk Lion, directed by ubiquitous Barrymore-winner Mary Tuomanen, about an alcoholic king of beasts who makes a new friend. Minora will do White Feminist, a comedy solo she developed during her Wilma Theater residency this year. ("I infused White Feminist with everything I learned the year before at Edinburgh," Minora says.) And Knittel's show is titled Nightmare Fuel, which she calls "a hilarious, sugar-high hellscape that is part teenage exorcism and part naughty slumber party." Post-Edinburgh, Davis comes back home to do a new show, The Presented, at Philly Fringe, where Knittel's Nightmare Fuel will also reignite. Davis says, "At Edinburgh, you have to go through bad shows, where audiences may not like you, hecklers, folks who get up and leave, some of the hardest days in your acting career. And then you'll have some of the best days, maybe right after the hardest ones. It's the best performance training you can get."